Coco Chanel said it best. And isn’t it just the truth! We adore working with brides who want to show their true selves on their wedding day! It was so much fun to celebrate real bridal beauty at the Elle Fashion Show at W Hotel’s Bridal Luncheon. Ladies-in-waiting to say I DO dined in a gilded celebration before heading upstairs to the chic hotel rooftop for fashion inspiration on the runway. 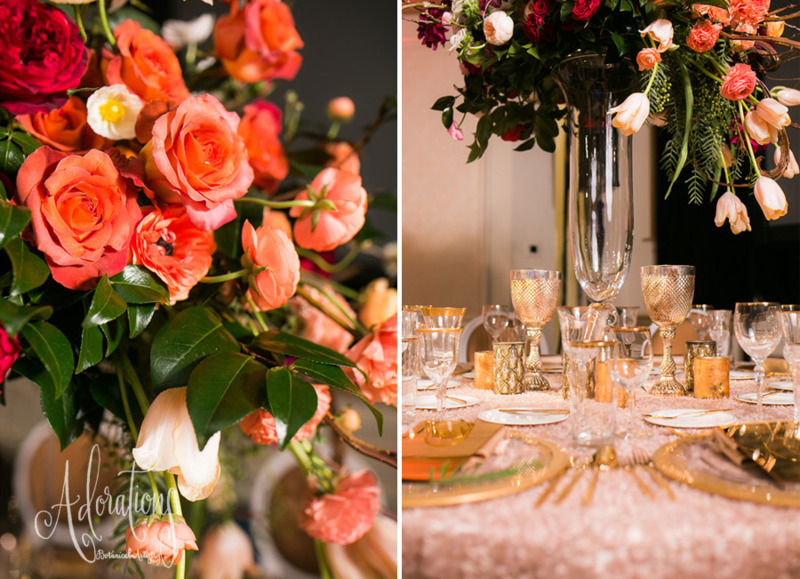 Adorations was thrilled to be one of the floral designers featured at the Elle Fashion Show, which was hosted in part by our friends at the Lofty Wedding Collection – Elle Bridal Boutique, Garrett Richardson Photography and Posh Paperie. Krystel Tien and the girls at Couture Events coordinated this fabulous show incorporating the works of four San Diego fleurists. Leaf it to Lexi created the stunning runway backdrop that was designed with ombre pink roses making the perfect entrance for the models, while Compass Florals did an amazing job decorating the tabletops for the ladies luncheon. Along with our fellow florists and The Dainty Lion, we contributed two bouquets for the fashion show; both of course, in our signature texturized style. Our first bouquet was fairytale-inspired and woodsy in charm with branches, scabiosa, peonies, patience garden rose, coneflower, dusty miller, kiwi vine and anemones. Bouquet number two, romantic in nature, comprised of blush and white peonies, protea, dahlias and white o’hara garden roses. It was just so exciting to see our fleurs working the runway in the hands of the beautiful bride models….especially with the paddle signs aligning the first row. Guests were able to flash a little “Love,” “Yes, Please” and “FAB!” as the complete looks hit the catwalk. Thanks so much to the wonderful team of vendors who worked together to make this one ELLE of a show!!! Coordinator: Couture Events. Venue: The W Hotel San Diego. Photography: Garrett Richardson. Invitations: Posh Paperie. Bridal Gowns: Elle Bridal Boutique. Cinema: Anthology Films. Florals: Leaf It To Lexi. Florals: The Dainty Lion. Florals: Compass Florals. Florals: Adorations Botanical Artistry. Rentals: Classic Party Rentals. Linens: Concepts Event Design. Sponsor: Exquisite Wedding Magazine. Set beachfront outside of the legendary Hotel Del Coronado, with the glowing iconic turrets as part of their scene, Christina and Sean had the romantic setting that Christina had always dreamed of. When I had first met with the beautiful bride-to-be to talk about her wedding décor, she had brought with her an inspiration board from a summer wedding she wanted to recreate with large dinner plate dahlias as the basis of the floral palette. Being that her wedding was a pre-winter affair in November, we had to tailor the plan to include seasonal flowers that could give the same grandiose effect and opted for large china mums to take the place perfectly. David Austin garden roses dominated the design with natural foliage that lent a handpicked styling, with subtle hints of metallic gold. Queen Anne’s lace, maidenhair fern, and white veronica imbued movement, peaking amongst the garden roses. We were able to weave in smaller varieties of dahlias to keep the bride’s original vision at play, but let the china mums do their job to emphasize the scale. Our favorite design element in Christina and Sean’s wedding was the crochet chuppah that added such unexpected personality to the décor. With nightfall, the chuppah illuminated in ambient lighting that complemented The Del’s iconic radiance making this one unique and gorgeous celebration. VENDOR: Photography: Pam Scott Photography. Location: Hotel Del Coronado. 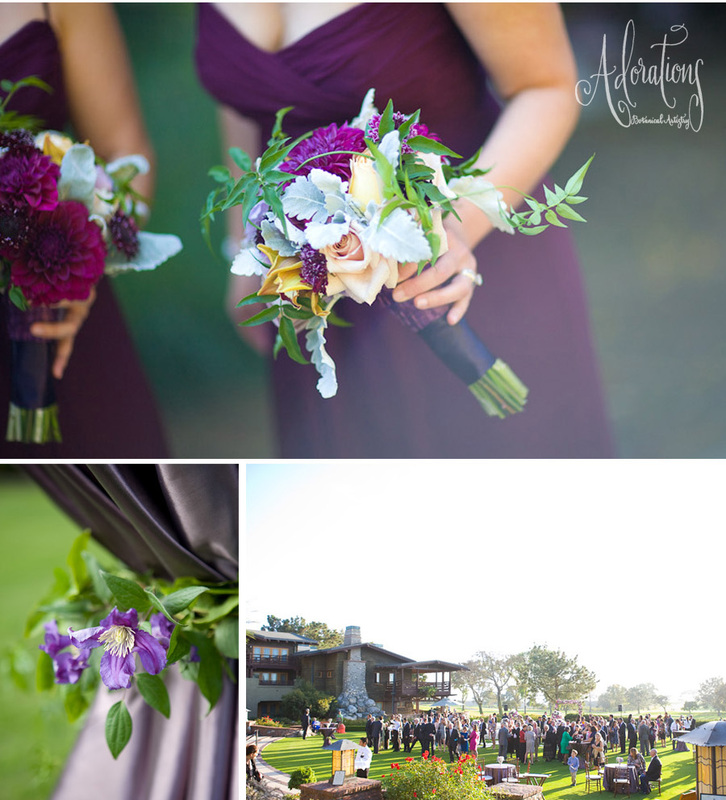 Coordination & Styling: Monarch Weddings. Floral Design: Adorations Botanical Artistry. Rentals: Concepts Event Design. Linens: La Tavola. 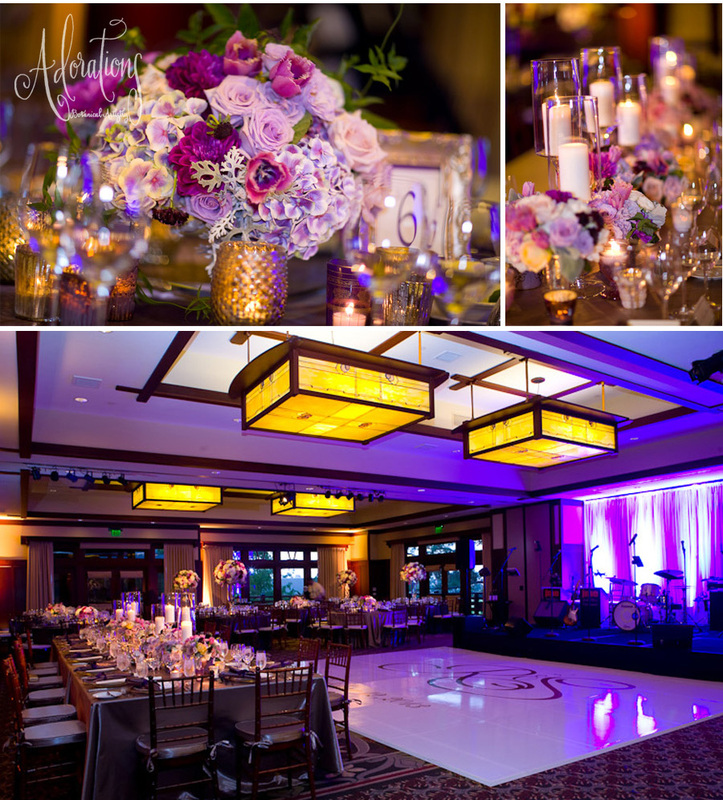 Lighting: San Diego Events Lighting. Menus: Whimsique Invitations & Stationery. As we ring in the New Year, Adorations Botanical Artistry would love to thank every one of our amazing vendor collaborators and couples for making 2014 such a successful and inspiring year of innovative design. I am truly humbled to look back on our incredible event décor and am so grateful to continue to share the collective work of many talented artists and professionals in our industry. This rooftop wedding celebration is no exception. In fact, it is one of my favorite events from this year, being with one of my extremely creative and stylish friends, Thomas Bui. Our modern couple chose one of San Diego’s most notable downtown haute spot’s for their ceremony and reception celebration, the Andaz Hotel. Keeping with the ultimate city-vibe, Thomas came to me with a vision to create elevated arrangements with suspended elements. While our couple was invested in their rooftop affair, Astrid, our bride, was transferred to Africa for a job and her husband-to-be Peter took over the final planning details. We all wanted her to be wowed with the final result… and that she was. The overall color palette was pure white boasting a dramatic grouping of florals, very Jeff-Leatham style with verdant greens brought into the reception décor. The bride carried a chic asymmetrical bouquet mixed with peonies, garden roses, and string of pearl succulent strands, lady slipper orchids, and ranunculus and cymbidium orchids. 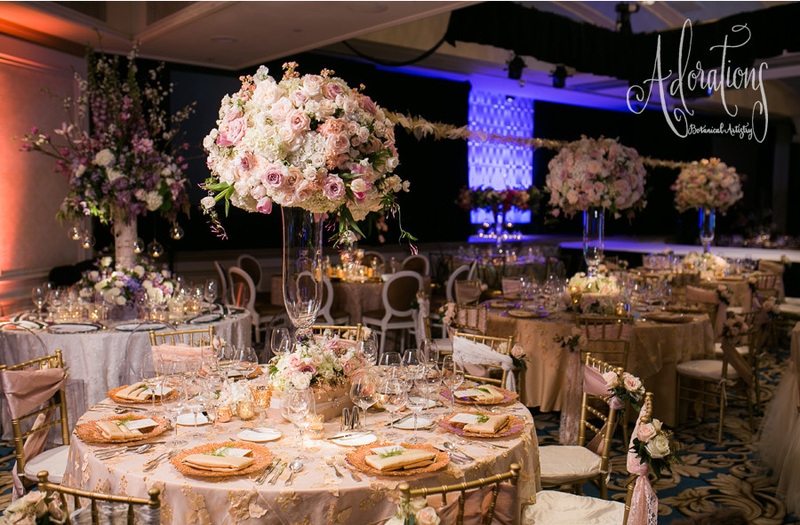 Since the Andaz is set in sections, as it doubles as a high-end nightlife venue as well, we had just one hour to turnover the orchid-infused ceremony site into a 65ft king table with the elevated tabletop installation during cocktail hour, transforming the space into an enchanting floral paradise. The tabletop of contemporary Lucite was the dwelling of sandblasted grapevine that rambled organically above guests’ heads with lush with foliage and hanging glass globes. Garden roses, scabiosa pods, brunia, hanging strings of pearls, succulents, fresh Spanish moss, and lotus pods comprised the table botanicals making this one OVER-THE-TOP table setting of 2014. VENDORS: Photography: Luna Photo. Location: Andaz, San Diego. Coordination & Styling: Thomas Bui Lifestyle. 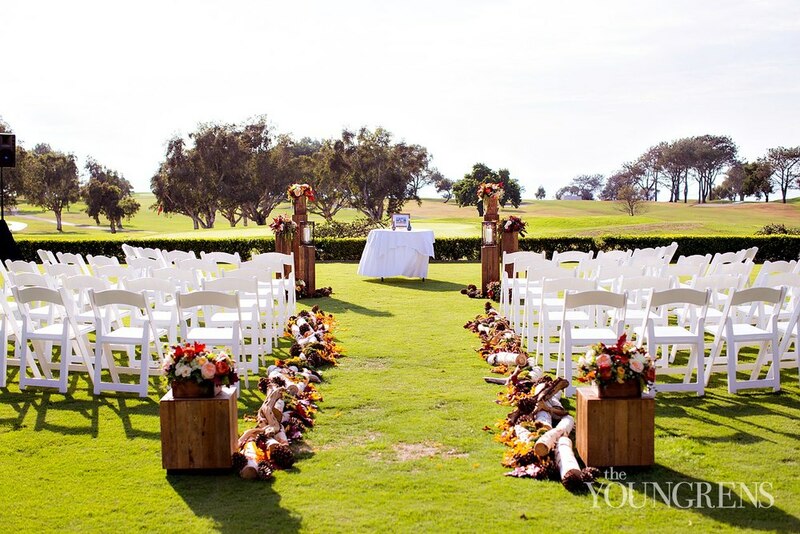 Rentals: Chiavari Chair Rentals. Floral Design: Adorations Botanical Artistry. Invitations and Stationery: Wendy Ware. Hair: Audra Rene. Makeup: Ann DeNicolo. Ceremony Magazine is now hot off the press with their brand new 2014 edition. We were thrilled to see Alexandra and Dave in our SOPHISTICATED GARDEN WEDDING featured on a four–page spread with Samuel Lippke Studios and Thomas Bui Lifestyle. 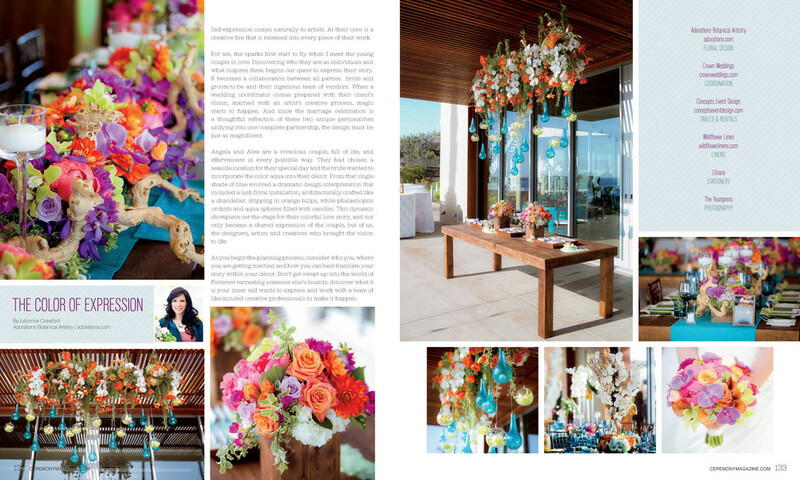 I am also honored that my article, The Color of Expression, showcasing the VIVID COASTAL WEDDNG décor is gracing the floral design section of the magazine, captured by The Youngrens with Crown Weddings. You can view the magazine in its entirely at CeremonyBlog.com/digital-magazines and see many more photos from these events right here on my site. These gorgeous new press features with Ceremony Magazine are so exciting, as they are practically in-sync with the launch of Adorations.com. 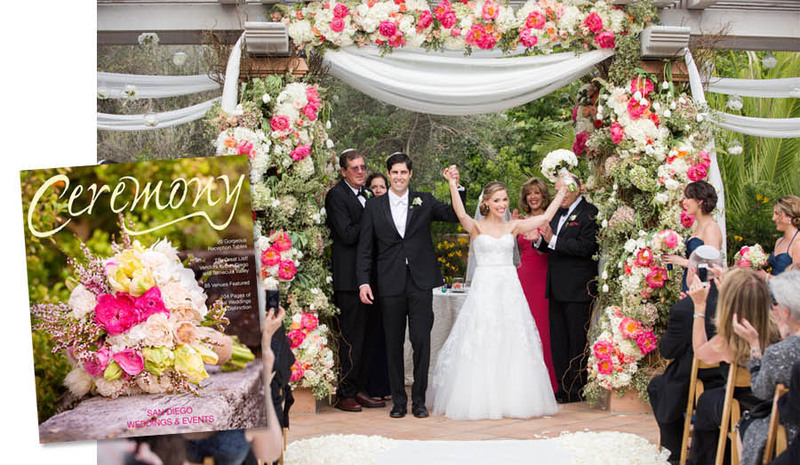 Ceremony Magazine is THE luxury wedding publication in Southern California showcasing over 300 pages of pure wedding ingenuity. I have had the pleasure of working one-on-one with the editors at Ceremony and I know that they pour their heart into the publication and it truly shows. I must admit, I am already planning a shoot for the upcoming issue (which you may get a sneak peak here) as I look forward to contributing more to the magazine and continuing our ongoing relationship. Thank you so much Ceremony for the beautiful features this year!